1broker.com Review 2019 – Scam or Not? Important: 1Broker.com was taken down by the FBI. The withdrawals at 1Fox still work but nobody knows how long. Better withdraw your coins. 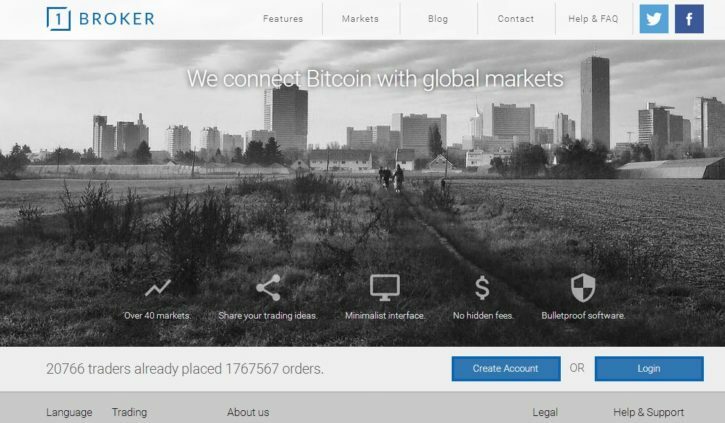 1broker.com is far more different than your normal Bitcoin exchange websites out there today. Have you ever wondered if you can trade Forex, Commodities, and Stocks using your Bitcoin? Yes, you can! We all know how volatile the Bitcoin exchange rate is due to manipulations and everything involved. In trade against global markets, your profit or loss is purely unaffected by the Bitcoin value. Does it sound new to you? Don’t worry, you can copy trades from successful traders and have a chance to look over their shoulders. 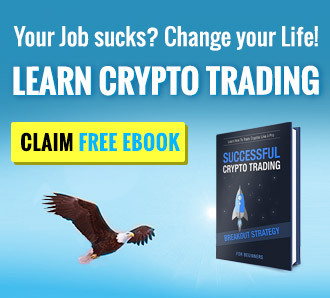 If you are already a successful trader, then you might want to look into this as this might help you earn passive income by showing people how you trade. I’m just amazed to see something that wasn’t made for each other. But seems to be in synergy. The website supports English and just recently added Deutsch and Español Languages. Their office address is located at Ajeltake Road, Ajeltake Island, Majuro, Marshall Islands MH 96960 – a very well known offshore location for anonyous companies. This unreal feat started in 2012 and is spearheaded by Nick Cote. How do you start with 1broker.com? It’s fairly easily actually, you just register through their website by clicking on the Create Account button. Create your username, enter your email address, add a password then hit “Create Account”. This action will send a notification to the email address used to register. Click on the confirmation link received, and you are good to go! The amazing thing is that you do not need to have a verification level in order to start trading with them. Once registration is complete, the default page would be the Social tab. This tab shows the “Popular” and “Successful” traders of the current month. 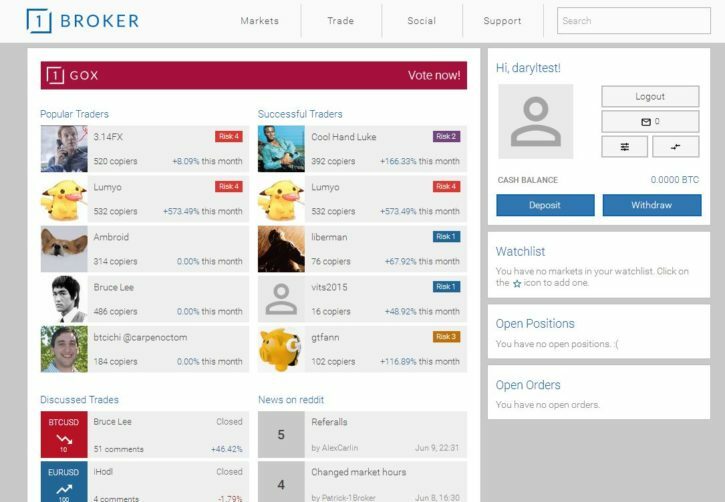 They made sure that new accounts would notice the popular traders and successful traders tab to get them interested (more discussed below). 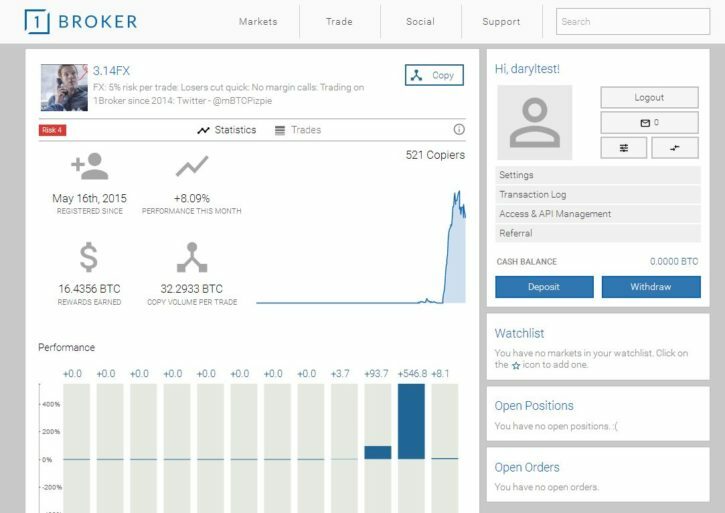 In 1broker.com you can copy trades from the masters of the art. Try clicking one of any names listed on the Social tab. I clicked on PiFX (3.14FX) as he has a cool name. Anyways, as you can see on the screenshot above, we are able to see everything that this trader has been doing in the past few months. The chart shows the trader’s significant performance during the month of May, which reached 546.8% at the highest. If you scroll further down, information like “average holding time”, “trades within the week” and for the “past twelve months”. 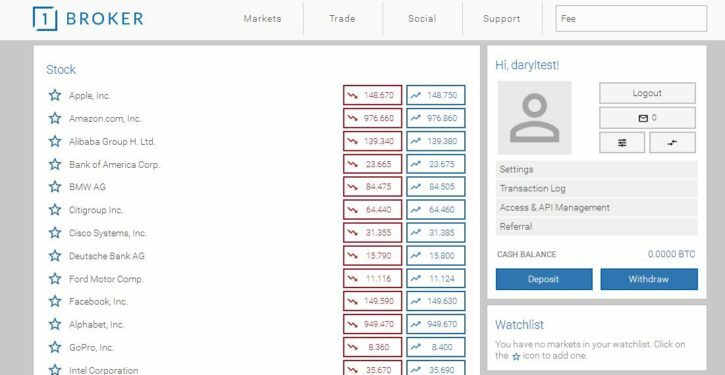 A little bit down and all the trades is categorized by how much Crypto, Forex, Stock or Commodity he has traded. Another thing that you need to notice is the risk level. This can be seen on the trader’s account just below their profile picture. PiFX here shows “Risk 4” so what does that mean? Risk levels are shown in the screenshot above. Basically, it tells us that the lower the risk, the lower the profit/loss of each trade. The higher the number, the greater the profit/loss. 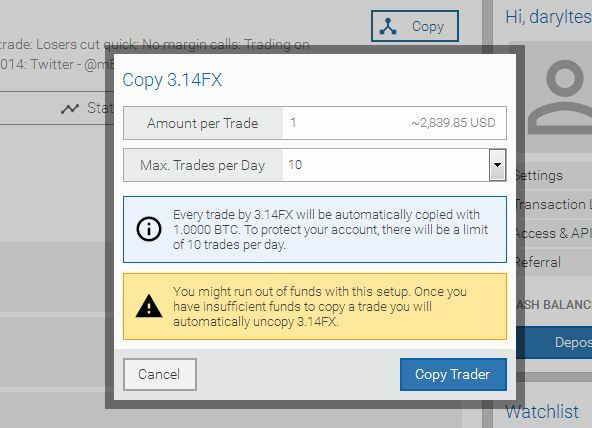 To copy a trade from a selected trader, you just need to click the “Copy” button located in the profile. Seen in the screenshot above, I placed 1 Bitcoin to trade. The value on the right side of the Bitcoin shows the current BTC/USD trade which is $2,839.85 per coin. 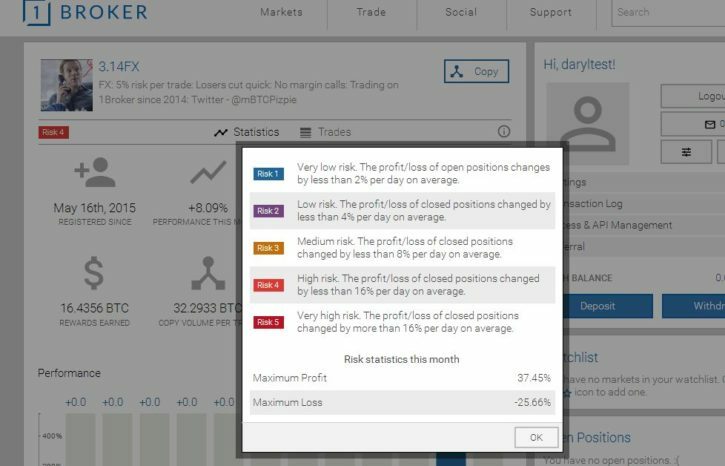 You can also change the maximum trades you copy from a trader. You can choose between 1,5,10, 25, 50 and 100 trades per day to protect your account from being siphoned. As a trade “Master” it would be possible to earn from other members that are following your shared ideas. If you are an experienced trader or just want to try out the trading scene yourself, then you just need to click on the “Markets” tab and choose from Forex, Stocks, Indices, Commodities and Crypto trades that you want to do. For example, in the screenshot above this shows the current stock market. 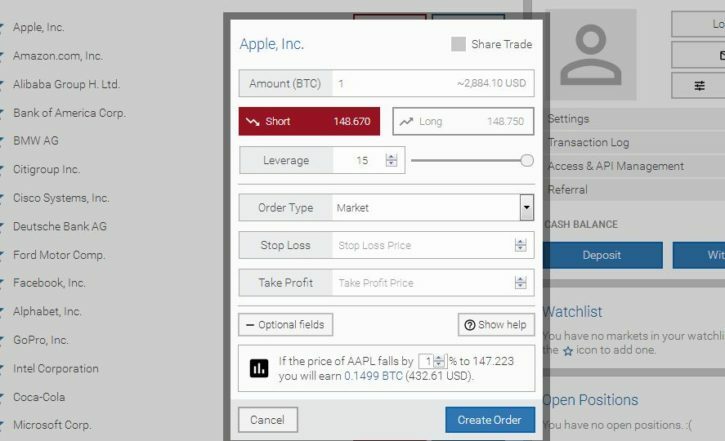 On the right-side, we’ve got the “Short” and “Long” trades that you want to be doing with them. Values automatically update once in a while (every few seconds). If you are not familiar with these terms, you can read more about it on this link. Clicking on either of the options would kick-start your trade and would open another window. Please be advised that margin trading is possible here at 1broker.com. I placed in 1 Bitcoin as a sample trade and clicked on “+ Optional fields” and “+ Profit/Loss Calculator” to open up extra tabs that you might want to change. You can also change the leverage value, order type and choose your Stop Loss/Take Profit functions through this window. There is no limit on how much you can trade as long as you have enough Bitcoin balance in your account. They also do not accept FIAT currencies through deposits nor exchanges would be available, but they do support FIAT trading. That is why it is important to have an external Bitcoin wallet and just transfer your funds directly to 1broker.com to start trading. There is no cryptocurrency trade only available would be BTC/USD, but they do not support that as of this moment until the 3rd quarter of 2017. “Our BTC/USD market was closed on May 25th, 2017. It will be replaced a brand-new dedicated trading platform, 1gox.com, which will launch in Q3 2017. Make sure to follow us on our social media channels to stay up to date.” -This note will pop up once you click on the BTC/USD trade. You can check more about their trading fees on this link. There has not been a single security breach since they have launched in 2012. When it comes to your Bitcoin, they store more than 95% deposits in hardware wallets and paper wallets. The only person that has direct access to these funds would be the majority stakeholder of the company to avoid conflict of interest. To add a layer of security, the wallet backups are distributed to different locations and stored in encrypted analog and digital form. To enable your 2FA security, you just need to log into your account and click on “Settings” which can be located on the right-hand side corner of your dashboard. Website homepage is easy on the eyes and informative. You can just scroll your way through their website and find almost everything that you need to know about them. The only thing that I had trouble finding would be the history of the company, how did they start and what was Nick Cote up to before this all began? Any of you guys familiar with that? Please share in the comment section below. Bitcoin trading itself is shady, to say the least, and when it comes to trading platforms, an excellent customer support service would be great. With 1broker, they only have email support, which is quite dull. A trading platform that connects global markets to Bitcoin definitely needs more than just email support. A recently posted video posted on YouTube shows how this user earned 29% with his first two weeks with 1broker. Sure 1broker is something different from other websites out there today as they bridge the gap between crypto currency and the real world trade. But the company itself is off-shore, this means that it is unregulated.The only thing that balances this would be the fact that they only accept Bitcoins. They also seriously lack customer service channels, which is a must when it comes to websites like this. A great idea but I would keep trading to a minimum and withdraw funds on a regular basis just to be safe.